BACKGROUND: Hypertension is an important treatable public health problem both globally and in India with an increasing prevalence significantly in both urban and rural population. It is one of the leading causes of adult mortality and morbidity, but poorly controlled hypertension remains a major health problem. OBJECTIVE: The objective of this study was to find out awareness, treatment, and control of hypertension among study population and association of hypertension awareness with sociodemographic factors, if any. MATERIALS AND METHODS: This study was conducted from May 2013 to April 2014 in the rural community of Singur block, West Bengal. Data were collected with respect to sociodemographic characteristics as well as records related to hypertension such as awareness, treatment, and control of hypertension. Blood pressure (BP) measurement of individuals aged 20 years and above of both sexes was done. Pearson's Chi-square test was performed to find out the association between the categorical variables. SPSS 19.00 software was used for analysis. RESULTS: Nearly 48.2% of the participants were aware of their elevated BP; 47.1% of the participants were taking pharmacological treatment, mostly allopathic and only 8.8% had their BP under control. A statistically significant association was found between age, education, and socioeconomic status (per capita income) with awareness of hypertension. CONCLUSION: Lack of awareness of the disease and very low rate of control of hypertension among those who were treated became the major issues. These findings emphasize the need for dissemination of knowledge about the disease and counseling of the patients during treatment continuation. Studies suggested low levels of knowledge on hypertension among patients, and lack of correct information and improper understanding of hypertension not only in rural areas, but also widely reported in urban environments and industrial countries. Rates reported for hypertension control were disappointing, which were suggested to be 13%–56% around the world. However, the awareness among the hypertensive patients is still low in Indian subcontinent may be because of lower literacy, inappropriate perception of medical advice, irregular sources of health-related information, or inadequate counseling regarding hypertension due to skewed doctor–patient ratios in government-run hospitals. Therefore, a comprehensive strategy for reduction in hypertensive morbidity should include prevention strategies such as increased awareness, early detection, adequate treatment, and strict control of blood pressure (BP). There are no robust, appropriate, and organized health education programs either at individual or community level to overcome the lack of awareness of the basics of prevention and control of hypertension and its risk factors among the general mass. With this backdrop, the study was undertaken to find out awareness, treatment, and control of hypertension among the study participants and to find out the association between awareness of hypertension with sociodemographic factors, if any. This community-based, observational, epidemiological study having cross-sectional design was conducted among people aged 20 years and above, for 1 year starting from May 2013 to April 2014 in a rural community of Singur block, Hooghly district of West Bengal, which is the rural field practice area of the All India Institute of Hygiene and Public Health (AIIH&PH), Kolkata. Sample size was calculated with a previous prevalence of hypertension (19.04%) and taking 20% relative allowable error and it came out to be 409 after applying the following formula: Zα2pq/L2, where Zα= 1.96, which is the standard normal deviate at a desired confidence level (95%); P = previous prevalence; q = 100 – p; and L = allowable error. Since multistage random sampling technique was followed, a “design effect” of 1.5 and also an additional 5% increase in the sample size were required to compensate for any nonresponse among the study participants. Hence, the calculated sample size came as 645 and finally 651 individuals were covered for the study. Two-stage random sampling method was followed for the selection of study participants. In the first stage, out of 64 villages of the study area, 20% were selected randomly; i.e., the primary sampling units were villages. In the second stage, from the selected villages, the required number of adult individuals was selected randomly. Therefore, the final sampling units were the persons aged ≥20 years. All the inhabitants aged 20 years and above were included in the study, after excluding unwilling individuals, pregnant women, and seriously ill patients. The study participants were interviewed at their family setting with the help of predesigned and pretested schedule after explaining the academic nature of this research and they were assured that information collected from them would be kept confidential and would be used only for research purpose. Each participant was examined for BP (using JNC 7 guidelines). During the study, individuals with BP level >140/90 mmHg were advised to visit the nearest union health centers for further investigations and treatment. Data collection was initiated only after receiving the Ethical Clearance Certificate from the Institutional Ethics Committee on December 20, 2012 (AIIH and PH, Kolkata - 700073). Informed written consent in the local language was taken from every interviewee. Control: With pharmacological treatment, SBP <140 mmHg and DBP <90 mmHg. The collected data were entered in Microsoft Excel worksheet (Microsoft, Redwoods, WA, USA) and checked for accuracy. After entering the data, they were checked for any duplicate or erroneous entry. The significance of association between awareness with the independent variables was analyzed by Pearson's Chi-square (χ2) test. P < 0.05 was considered statistically significant. All the statistical analyses were done using SPSS software, version 19.0 (Statistical Package for the Social Sciences Inc., Chicago, IL, USA). The present study showed that majority (32.9%) of the study population belonged to 20–30 years' age group and only 8.3% were in the age group of 60 years and above (mean age 38.4 ± 14.3 years); 47.2% were male and 52.8% were female. Most of the respondents (94.2%) belonged to the Hindu religion and 54.2% were from nuclear family. Among them, 79.9% were currently married followed by 16% who were never married. Nearly 30% had a literacy status up to primary school completion followed by 23.2% middle school completion and 16.3% were illiterate. Around 74.7% of the participants were sedentary workers and the rest (25.3%) were moderate workers as per the “Classification of activities based on occupations” by the National Institute of Nutrition. By occupation, 42.4% of the study population were homemaker and 15.8% were farmers. Nearly half (47%) belonged to Class IV socioeconomic category followed by 45.3% in Class V socioeconomic category as per the modified B.G. Prasad's scale 2013. Among hypertensive participants (170, i.e., 26.1%), 82 (48.2%) were already known hypertensive, i.e., aware of having hypertension, while 88 (51.8%) participants were newly diagnosed hypertensive by the researcher. Eighty-two out of the 170 hypertensive participants (48.2%) were aware of their elevated BP; 80 (47.1%) participants (male 44.8% and female 48.5%) were taking pharmacological treatment for the condition, mostly allopathic. However, only 15 (18.7%) participants out of those 80 who were under treatment had their BP under control; where males outnumbered females (23.3% vs. 16.0%). 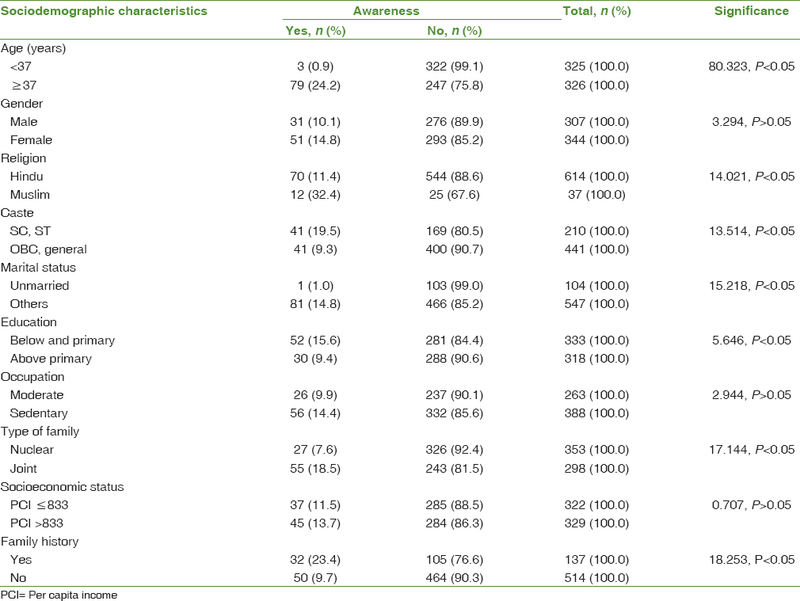 This proportion is coming down to 8.8% when compared out of the total hypertensive participants (15/170) [Table 1]. Participants aged 37 years or above, females, belonging to Muslim community and SC/ST community, educated above primary level, of sedentary occupation, of joint family, with per capita income >833 rupees, and having a positive family history had more awareness compared to their respective counterparts. A statistically significant (P < 0.05) association was found with age, religion, caste, marital status, education, type of family, and having a family history of hypertension by Pearson's Chi-square test [Table 2]. In this cross-sectional study, we aimed to assess awareness, treatment, and control of hypertension among the rural population of Bengal. Nearly half (48.2%) of the participants were aware of hypertension; 47.1% were taking treatment and only 15 (18.7%) among them had controlled BP which was 8.8% when compared out of the total hypertensives (15/170). Competing health priorities (such as the existing burden of maternal and child health, communicable diseases) and scarce health resources affect the availability, accessibility, and affordability of public and private health services. Furthermore, a combination of socioeconomic factors (increased dependence, burden of drug costs), attitudes toward regular medicine intake, and a low level of overall education possibly contributed to the low level of awareness, treatment, and control of hypertension in our study sample. Awareness of participants regarding hypertension was found to have statistically significant (P < 0.05) relation with age 37 years or above, females, Muslim community, SC/ST community, education above primary level, sedentary occupation, joint family, per capita income >833 rupees, and a positive family history of hypertension. Sathish Kumar et al. in Manipur showed that though hypertension was highly prevalent awareness was poor (42.5%); treatment and control were 30.8% and 11.4%, respectively. In the present study, awareness and treatment were more, but control was less than that of the study done by Sathish Kumar et al. Zinat Motlagh et al. in Iran showed that treatment rates were higher in females (75.5%) and lower in males (37.7%), but control rates were higher in both males (30.7%) and females (31.4%) than that of the present study. Habitat, education, income, family history with hypertension, smoking, and time of diagnosis to the disease were found to be related to the treatment of the disease. Wang et al. in a study in China showed that the awareness, treatment, and control rates among all hypertensive participants were 42.6%, 34.1%, and 9.3%, respectively, and control rate among the treated participants was 27.4%, which is almost similar to the present study. The present study showed that the awareness, treatment, and control rates among all hypertensive participants were, respectively, higher than those of Bhardwaj et al. and Yuvaraj et al., but lower than those of Polonia et al. in Portugal and Yip et al. Gupta showed that middle-aged Asian Indian women had very low awareness, treatment, and control of hypertension. Although there was a high prevalence of awareness of hypertension (42.8%), it was higher in in urban (56.8%) areas than rural areas (24.6%). Among hypertensive participants, treatment was noted in 18.3% (rural 13.1, urban 22.5) and control in 3.9% (rural 1.3, urban 5.9). A significant determinant of low awareness, treatment, and control was rural location (multivariate-adjusted P 0.05 SPSS software, version 19.0 (Statistical Package for the Social Sciences Inc., Chicago, IL, USA). Lee et al. in South Korea showed that awareness, treatment, and control of hypertension were 60.1%, 91.7%, and 27.2%, respectively, more than the present study. In both sexes, age ≥60 years was positively associated with higher awareness, treatment, and control, whereas body mass index was positively (female) and negatively (male) associated with BP control. In women, family history of diabetes mellitus was positively associated with higher awareness and treatment, whereas low waist circumference was positively (male) and negatively (female) associated with BP control. In the present study, awareness was significantly (P < 0.05) related with age, religion, caste, marital status, education, type of family, and family history of hypertension in both sexes. Mohan et al. in Chennai showed that among the total hypertensive patients (32.8%), 70.8% were under treatment and 45.9% had their BP under control (men more than women), which is lower than the current study. The results of the present study showed that compared to the Western population, there is a long way to go to accomplish the goal of optimal control among rural Indian population. It took at least 30–40 years of sustained effort to substantially improve hypertension detection and control in Western countries and the rates are still far from optimal. It is therefore obvious that considerable effort is needed to prevent or reduce the increasingly large burden of disease related to increasing rates of hypertension in countries in epidemiological transition, such as India. The “rule of halves” for hypertension states that: “half the people with high blood pressure are not known, half of those known are not treated and half of those treated are not controlled.” If this rule is valid, then only one in eight of the hypertensive population would be receiving optimal treatment. An attempt was made to assess the applicability of the rule of halves in the rural Indian population in this study. The present study showed little improvement in detection, treatment, and control of hypertension compared to earlier studies in rural India. In this community-based study, we had interviewed participants and their BP was recorded for single time. As the data collection period was 12 months covering all the seasons of the year, there might be some error due to seasonal variation of BP. Again, BP was recorded at individual household level during daytime, so normal diurnal variation of BP could not be assessed. An overwhelming 80% of the respondents had no idea about the history of hypertension, diabetes mellitus, etc., in the family. Quality of this information has its inherent weakness. Being a cross-sectional study, the possibility of recall bias could not be ruled out regarding awareness, treatment (regularity of medication), and control of hypertension. In this community-based study, we observed that awareness, treatment, and control rates of hypertension were low. Public health programs and practical strategies are required to improve prevention, management, and control of hypertension in the community. Newer ideas in hypertension education such as involvement of mass media may be tried as in case of vaccines. The health workers have to play a part by educating the people and also themselves being an example. In particular, attention should be given to the elderly, obese, and those with a family history of hypertension, while raising awareness and treatment among younger adults. It is also recommended that regular BP checkup should be done among the community for early detection of hypertension and to prevent complications. These findings emphasize the need for dissemination of knowledge about the disease and counseling of the patients during treatment continuation. We are grateful to all the Officer-In-Charges of Rural Health Unit and Training Centre, Singur, for their support to carry out the work in the above-mentioned area. We are also grateful to all the health workers and accredited social health activists of the respective villages for their extensive collaboration, without which this study could not have been conducted. World Health Organization. Global Brief on Hypertension. Geneva: World Health Organization; 2013. Available from: http://www.apps.who.int/iris/bitstream/10665/79059/1/WHO_DCO_WHD_2013.2_eng.pdf. [Last accessed on 2013 Jun 16]. Lee HS, Park YM, Kwon HS, Lee JH, Park YJ, Lim SY, et al. Prevalence, awareness, treatment, and control of hypertension among people over 40 years old in a rural area of South Korea: The Chungju Metabolic disease cohort (CMC) study. Clin Exp Hypertens 2010;32:166-78. Bhardwaj SD, Sinha U, Shewte MK, Khadse JR, Bhatkule PR. Prevalence, awareness, treatment and control of hypertension among the people above 15 years in rural area, Nagpur, Maharashtra – A cross-sectional study. Natl J Community Med 2012;3:213-7. Kokiwar PR, Gupta SS. Prevalence of hypertension in a rural community of Central India. Int J Biol Med Res 2011;2:950-3. Ostchega Y, Dillon CF, Hughes JP, Carroll M, Yoon S. Trends in hypertension prevalence, awareness, treatment, and control in older U.S. Adults: Data from the national health and nutrition examination survey 1988 to 2004. J Am Geriatr Soc 2007;55:1056-65. Li X, Ning N, Hao Y, Sun H, Gao L, Jiao M, et al. Health literacy in rural areas of China: Hypertension knowledge survey. Int J Environ Res Public Health 2013;10:1125-38. Pickering TG. Why are we doing so badly with the control of hypertension? Poor compliance is only part of the story. J Clin Hypertens (Greenwich) 2001;3:179-82. Beunza JJ, Martínez-González MA, Ebrahim S, Bes-Rastrollo M, Núñez J, Martínez JA, et al. Sedentary behaviors and the risk of incident hypertension: The SUN cohort. Am J Hypertens 2007;20:1156-62. Biradar SS, Reddy S, Raju SA, Kapatae R. Assessment of pharmacist mediated patient counselling on knowledge, attitude and practices on hypertension in compliance with antihypertensive drugs in South Indian city. Int J Pharm Life Sci 2012;3:1733-8. Meredith PA, Ostergren J. From hypertension to heart failure – Are there better primary prevention strategies? J Renin Angiotensin Aldosterone Syst 2006;7:64-73. World Health Organization. Steps Surveillance: Preparing the Sample. Sec. 2. World Health Organization; 2008. Chobanian AV, Bakris GL, Black HR, Cushman WC, Green LA, Izzo JL Jr, et al. The seventh report of the joint national committee on prevention, detection, evaluation, and treatment of high blood pressure: The JNC 7 report. JAMA 2003;289:2560-72. Burt VL, Cutler JA, Higgins M, Horan MJ, Labarthe D, Whelton P, et al. Trends in the prevalence, awareness, treatment, and control of hypertension in the adult US population. Data from the health examination surveys, 1960 to 1991. Hypertension 1995;26:60-9. Wang J, Zhang L, Wang F, Liu L, Wang H, China National Survey of Chronic Kidney Disease Working Group, et al. Prevalence, awareness, treatment, and control of hypertension in China: Results from a national survey. Am J Hypertens 2014;27:1355-61. Gopalan C, Rama Sastri BV, Balsubramanian SC. Nutritive Value of Indian Foods. 1st ed. Hyderabad: National Institute of Nutrition Hyderabad, Indian Council of Medical Research; 2012. p. 9-10. Dudala SR, Arlappa N. An updated Prasad's socioeconomic status classification for 2013. Int J Res Dev Health 2013;1:26-8. Sathish Kumar K, Singh AB, Asem P. Prevalence, awareness, treatment and control of hypertension in urban communities of Imphal, Manipur. International Journal of Interdisciplinary and Multidisciplinary Studies (IJIMS) 2015;2:61-70. Zinat Motlagh SF, Chaman R, Ghafari SR, Parisay Z, Golabi MR, Eslami AA, et al. Knowledge, treatment, control, and risk factors for hypertension among adults in southern Iran. Int J Hypertens 2015;2015:897070. Yuvaraj BY, Nagendra Gowda MR, Umakantha AG. Prevalence, awareness, treatment, and control of hypertension in rural areas of Davanagere. Indian J Community Med 2010;35:138-41. Polonia J, Martins L, Pinto F, Nazare J. Prevalence, awareness, treatment and control of hypertension and salt intake in Portugal: Changes over a decade. The PHYSA study. J Hypertens 2014;32:1211-21. Yip W, Wong TY, Jonas JB, Zheng Y, Lamoureux EL, Nangia V, et al. Prevalence, awareness, and control of hypertension among Asian Indians living in urban Singapore and rural India. J Hypertens 2013;31:1539-46. Mohan V, Deepa M, Farooq S, Datta M, Deepa R. Prevalence, awareness and control of hypertension in Chennai – The Chennai urban rural epidemiology study (CURES-52). J Assoc Physicians India 2007;55:326-32. Whelton PK. Epidemiology of hypertension. Lancet 1994;344:101-6.